This is a snapshot of me c.1971 outside my garage/workshop with a couple of boards I had built. The blue one is about a 6' 6" as I remember, single fin, vee through the mid-section, and standard polyurethane construction. I rode that board quite a while. 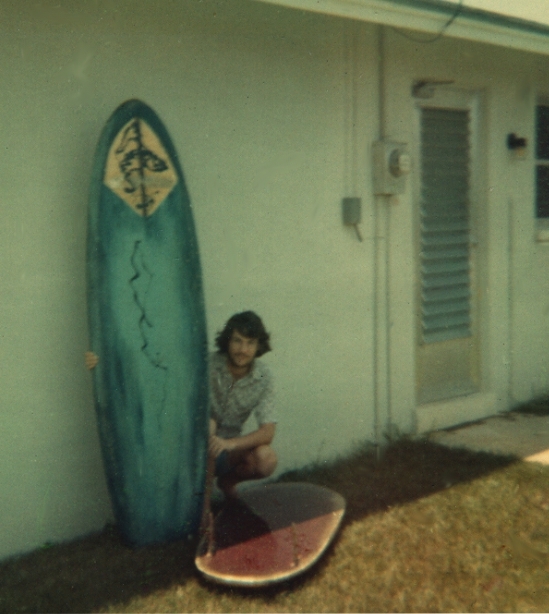 The other was my first polystyrene board and also my first twin-fin. I had just shared a surf (well, we were in the water at the same time) with the late Australian champion Keith Paull and he was on a brand new two-fin board. This was at the north jetty of Sebastian Inlet, back when it was still illegal to surf there! Anyway, I was impressed enough with his surfing (though he probably could have made any board look good) to go home and make myself something similar, rounded template, 5' 8'' long, thick, with boxy-but-hard rails. Unfortunately, I snapped it fairly quickly. It happens. It wasn't that good a board, so not a big loss. Speaking of losses, the Keith Paull story is one. Among the best surfers of his time, within a few years he descended into drug use and schizophrenia and never came back. He passed away, still a relatively young man, about a decade ago.